“Homage to the Square: Renewed Hope,” 1951. Photo Tim Nighswander/Imaging4Art; © 2018 The Josef and Anni Albers Foundation. Homage to the Square: Departing in Yellow,” 1965. Photo by Tim Nighswander/Imaging4Art; © 2018 The Josef and Anni Albers Foundation. Cover of Charles Darwent's 2018 biography. 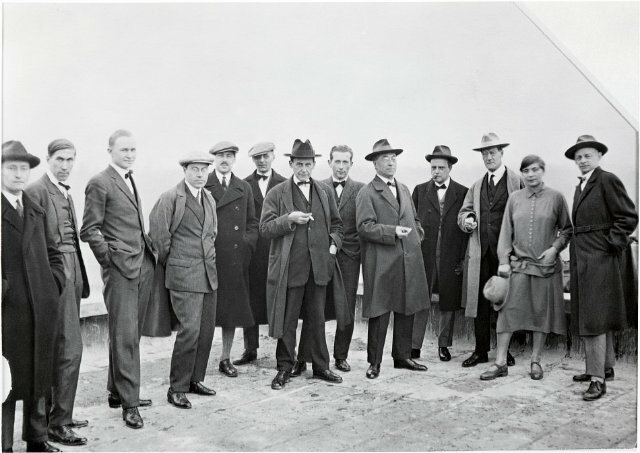 The Bauhaus faculty with Gropius in the middle. Self Portrait, 1916, ©2018 The Josef and Anni Albers Foundation/ Artist's Rights Society (ARS). ? Josef and Anni arriving in America, 1933, AP. 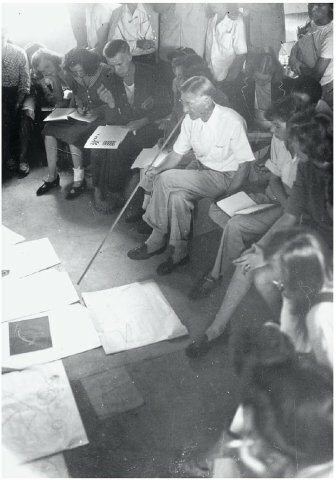 Albers teaching at Black Mountain College, ca.1948. Photograph: Courtesy the Josef and Anni Albers Foundation. 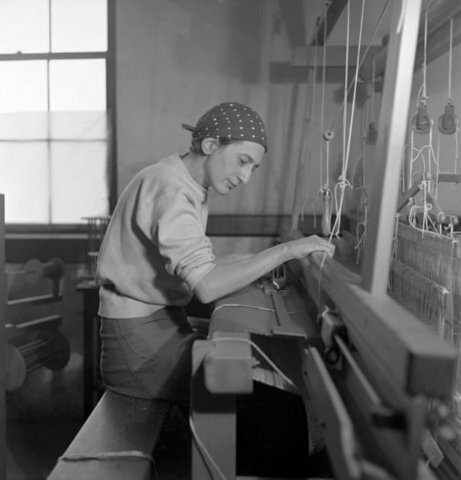 Anni Albers in her weaving studio at Black Mountain College, 1937. Photograph: © 2018 The Josef and Anni Albers Foundation. Albers during the Yale years. Although this is the first full biography of Bauhaus master, Josef Albers, it has been worth the wait. Charles Darwent has writen a meticulous, insightful, absorbing and masterful book. The austere, formalist painter, glass artist, designer, printmaker and teacher was born the son of a craftsman in Bottrop, German on March 19, 1888, and died in New Haven, having retired from Yale University, on March 25, 1976. Only at the end of his career was recognition as an artist on a par with a reputation as a teacher and theorist of color. Remarkably, he was involved with the three most renowned art schools of the 20th century. He joined The Bauhaus in 1920 as a student. After an interval of several years he was promoted to a position as a master on a par with Vasilly Kandinsky, Paul Klee, László Moholy-Nagy, Johannes Itten, Gerhard Marcks, Oskar Schlemmer and Lyonel Feininger among other artists in a school headed by the architect Walter Adolph Georg Gropius. When the school was closed by the Nazis in 1933, through Museum of Modern Art curator and architect, Philip Johnson, he was offered a position at the experimental Black Mountain College in Ashville, North Carolina. In November 1933, he joined the faculty of the new college where he was the head of the painting program until 1949. He spoke no English and conducted crits with gestures and demonstrations. By 1950, he was appointed head of the department of design at Yale University from which he retired in 1958. 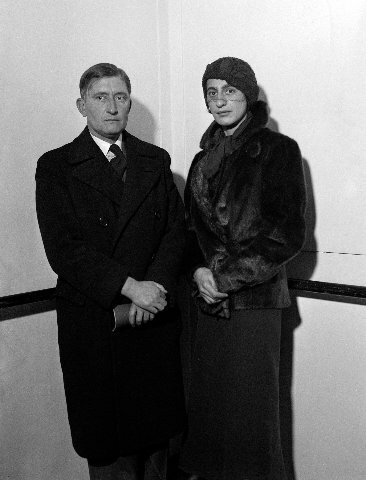 It is often assumed that Josef Albers and his wife Anni, a weaver, brought the Bauhaus concepts to America first at Black Mountain and then Yale. In all of his teaching positions Albers encountered enormous struggle and adversity. The book lays out the infighting and politics of internal as well as external forces from Nazis to the administration of Yale University. Given the enormity of the Albers struggles in Germany replication of the dynamics and protocols of the Bauhaus was not a mandate. They left Germany behind and only returned late in life when he was honored. Albers the man was different from the austerity of the work. He was stubborn, contrarian, and a randy, fanny- pinching, womanizer who routinely seduced students. Their marriage entailed an arrangement. It is understood that they respected each other as artists. The closing of The Bauhaus scattered the most brilliant faculty of artists and architects ever assembled. Some of them transplanted concepts of pedagogy, abstract art, design, and International style architecure to America. Most literally László Moholy-Nagy founded the New Bauhaus in Chicago but it closed after a year, in 1938, because of a lack of funding. He brought with him the young Hungarian artist György Kepes. He founded The Center for Advanced Visual Studies (CAVS) in 1967 within MIT's School of Architecture and Planning. He was CAVS director from 1967 until his retirement in 1974. Kepes expanded the Bauhaus paradigm to embrace art, science and technology. In 1985, Nicholas Negroponte founded the MIT Media Lab initially with a focus on robotics and artificial intelligence. There is a Bauhaus geneology that threads through contemporary art and design. The founder of the Bauhaus, Gropius, and his protégé, Marcel Breuer, moved to Cambridge, Massachusetts. He chaired the Harvard Graduate School of Design (1937–1952). In 1946, Gropius founded The Architects' Collaborative (TAC). While one of the most respected architectural firms in the world it went bankrupt in 1995. By then post modernism was ascendant. Bauhaus artist, the American born Lyonel Feininger, left Germany in 1937 and taught at Mills College. 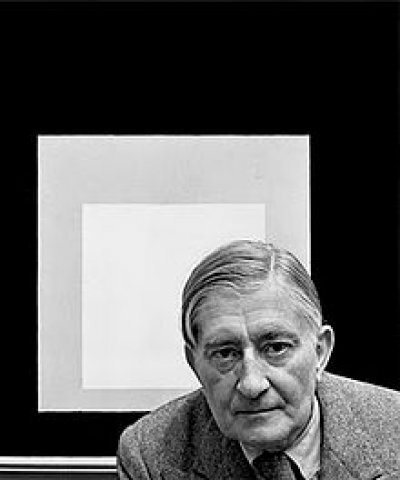 Albers invited him to teach summer school at Black Mountain in 1945. His son, T. Lux Feininger, taught at Harvard as well as Sarah Lawrence and the School of the Museum of Fine Arts (Boston). Another son, Andreas, was a renowned photographer. When Gropius resigned he was replaced by the architect Ludwig Mies van der Rohe. It was Mies, as he was called, who negotiated with the Nazis for a non violent closure of The Bauhaus in 1933. Realizing that there would be little work, in 1937, he emigrated to America accepting a residential commission in Wyoming. He was appointed head of the architecture school at Chicago's Armour Institute of Technology (later renamed Illinois Institute of Technology). He was commissioned to design new buildings and a master plan for the campus. This included a masterpiece the S.R. Crown Hall. There would be other landmarks in a 31-year American career. His tall office and residence buildings in Chicago and New York defined the paradigm of American urban architecture. His style and concepts were ubiquitous then generic. The glass and steel renderings of Gropius and Mies in the 1920s morphed into an American vernacular. There was an eventual backlash to the “Less is More” mantra of Mies. In 1966 the American architect Robert Venturi quipped “Less is a Bore.” He published “Complexity and Contradiction in Architecture,” calling for decoration, symbolism, color, pattern and deconstructed classical references. Like mannerism following renaissance classicism it evoked a return to disegno. Bauhaus in America was overwhelming. How and why that happened is an aspect of centennial scholarship and critical analysis. As a weaver and designer Anni was a pioneer in her field. She taught weaving at The Bauhaus and Black Mountain. At Yale there was no position available in the all male faculty. Joself tried to change that as well as enroll women. In many aspects Yale was reactionary and faculty wanted to return to teaching egg tempera painting in the manner of Social Realism and Regionalism. When consulted MoMA's Alfred Barr suggested hiring Social Realist Ben Shan to direct the school. 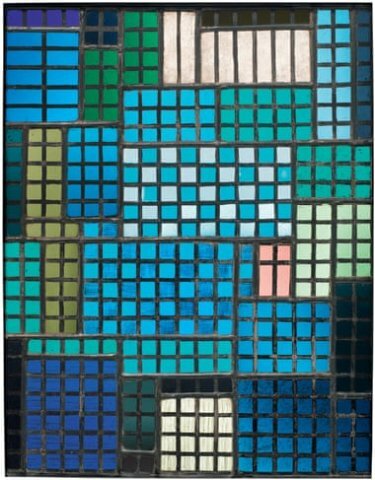 The series “Homage to a Square,” a nesting of endlessly varied combinations of color in a few configurations, is the work for which Albers is best known. The artist routinely destroyed his work but some 2,300 examples survive. They comprise paintings on masonite and silk screened prints. Painted flatly with a palette knife he wrote on the back colors used. Through research he established that pigments from different manufacturers varied significantly. Darwent front loaded the book with an art historical, critical analysis of this extensive series. It is an enticing way to set the stage for the chronological treatment that follows. There is a plethora of anecdotal material and discussion of work but, other than the first chapter, this is not a book strictly for art historians. An interviewer asked why a full book on Albers took so many years? Darwent replied “It’s odd isn’t it? It’s partly because he was so secretive. When I said I was doing this book, Magdalena Droste, the queen of Bauhaus scholarship, said: ‘Why did you choose Albers? He’s so pale’. I think what she meant is that he made himself appear colourless and inscrutable and unknowable, and I think that’s probably part of the reason why it has taken so long. “I think it was also that he had gone to America and people couldn’t quite decide what he was. He was quite old when he ‘made it’, so there was the question of whether an old man can really make new art. When they went to America, something that drove both him and Anni Albers mad was that they were treated as artefacts rather than as people, because they had been to the Bauhaus. The Bauhaus became a kind of albatross round his neck. Like many artists Albers was more adept at making than marketing his work. That started to change when he was represented by the New York gallerist Sidney Janis. There were legal issues and the attorney/ collector Lee Eastman (born Leopold Vasil Epstein, 1910-1991) was retained. Eastman represented Paul McCartney starting just prior to the breakup of The Beatles. He delved into the mess of Apple Records. McCartney married Linda Eastman who died young in 1998. He also represented Willem de Kooning. On behalf of Albers Eastman asked for an account of sales from Janis. Galleries, routinely pressed for cash, are notorious for delayed payments to artists. At that time there were primarily handshake contracts. Albers was owed money which eventually was paid. Although Janis was generating sales they were for modest prices. An “Homage” painting could be had for under a thousand dollars. Supply far outstripped demand. Eastman initiated steps to limit inventory to increase evaluation. Once harder to come by competition for work increased its value. Several paintings in his series "Homage to the Square" have outsold their estimates. 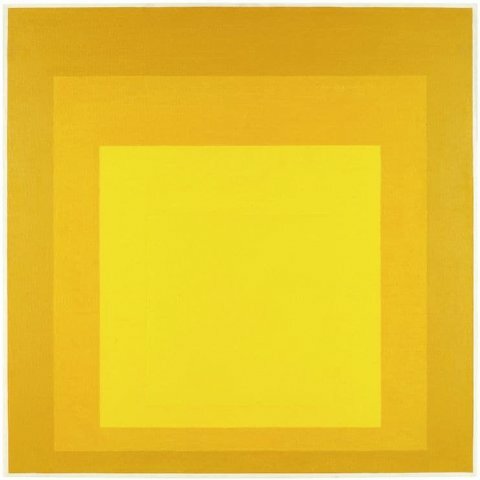 "Homage to the Square: Joy" (1964) sold for $1.5 million, nearly double its estimate, during a 2007 sale at Sotheby's. More recently, "Study for Homage to the Square, R-III E.B." also sold for around twice the estimated $545,000–$700,000, reaching $1.22 million at auction. Janis proposed an exhibition pairing Albers and Piet Mondrian. By then the artist was estranged from his gallerist and never replied to the correspondence. 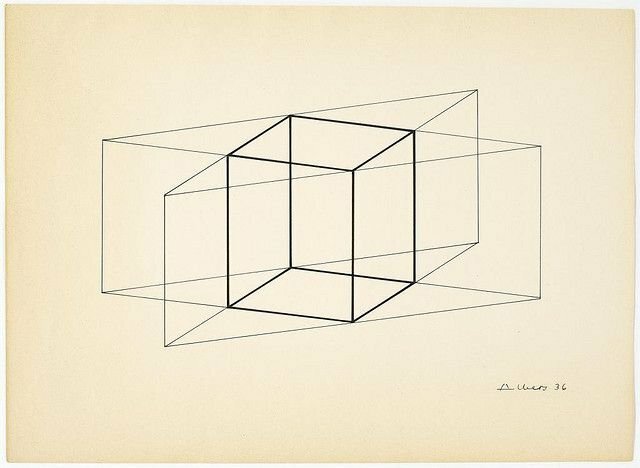 In 1965, works by Albers were included in The Responsive Eye a MoMA exhibition curated by William C. Seitz. It featured a movement dubbed as Op Art which, for a time, competed with Pop Art. One of the leading Pop artists, Robert Rauschenberg, had been an Albers student at Black Mountain. His combines are said to have evolved from an Albers course which often entailed gathering organic materials to fabricate collages. At the Bauhaus the first works in glass by Albers combined scrap elements. Few of these seminal works survived but some were later replicated and expanded as architectural commissions. Just ten years short of his death Albers was viewed as a progenitor of movements including Op Art, Minimalism, and Hard Edge Painting. With feisty independence bordering on the eccentric Albers was none of these. His work was forged from spiritualism, experimentation, and rigorous discipline. That took shape early on when he transitioned from being a secondary school educator and son of a craftsman. There is a lot of his father in work which at the Bauhaus elevated to another level. Following the death of his brother Paul during WWI he engaged in a series of self portraits in a range of techniques and stylistic approaches. This aspect of the work was fascinating and unfamiliar. It was surprising to discover this romantic/ expressionist juvenalia. The book reproduces early still life and landscape drawings. There is a 1916 lithograph of a rabbit. Like other modernists he evolved from studies of nature to abstract art. Despite flagrant peccadilloes he was a devout Roman Catholic. Like Andy Warhol, he attended daily mass. Arguably. the secretive and inscrutable Albers, like Warhol, was more sinner than saint. With its mystical cycles of sin, confession and redemption Catholicism inadvertently encourages this peculiarity. The greatest saints were repentant sinners. His long and distinguished career started modestly. From 1908 to 1913 he was a schoolteacher in his home town, Bottrop . For this he trained at Königliche Kunstschule in Berlin from 1913 to 1915. 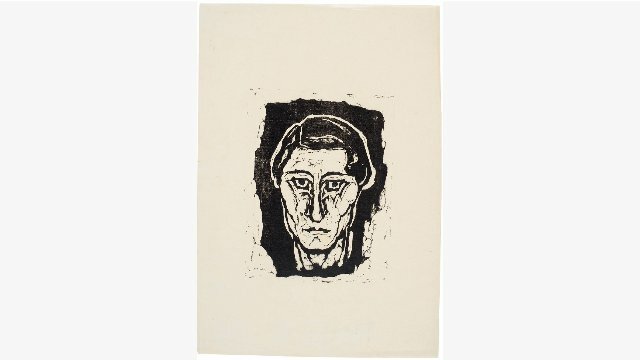 From 1916 to 1919 he began printmaking at the Kunstgewerbschule in Essen. By 1920 he matriculated to The Bauhaus in Weimar. He took the preliminary course (Vorkurs) of Johannes Itten. Given his prior education and teaching experience he became an instructor of glass work as a component of architecture. Later he was a member of the foundation team and 'Werklehre' of the department of design with a focus on handicrafts. He introduced students to fundamentals. That was key to his later practice at Black Mountain and Yale. Former students were known for very different work but many stated that his use of materials, craft, and theory of color were key to their development. Later at Yale he was furious when administrators discontinued teaching undergraduates. It was among the many battles and setbacks that he endured in academia. At the Bauhaus, as a glass and print maker, he was outranked by the fine artists. Most of them came from bourgeois families compared to his blue collar heritage. With a former student Albers married above his class to Annelise Else Frieda Fleischmann (June 12, 1899 – May 9, 1994). Her mother was heiress to a major publisher and her father made furniture. They were a complex couple and today her work is widely regarded. In 2015 Helen Molesworth, then with the Institute of Contemporary Art, Boston, curated an exhibition with an extensive catalogue for Leap Before You Look: Black Mountain College 1933–1957. The work of Josef and Anni was prominently featured. The critical thinking and organization of the catalogue, however, was informative but not insightful. Black Mountain was too broad and complex a subject which she embraced as a conceptual project. The installation was a daunting but fascinating collage of elements. Marking The Bauhaus centennial, in 1999, there are projects and publications related to its celebration. There is much yet to learn about the seminal art school that combined fine arts, architecture and design. Through Albers Darwent has taken us behind the scenes. 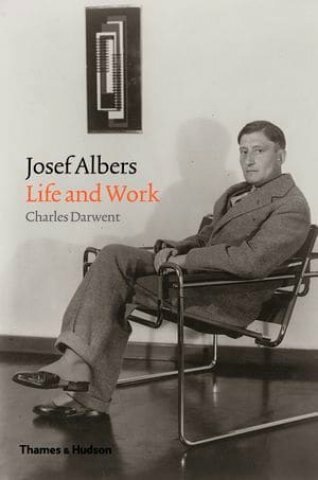 The book elevates Albers to a status equal to better known colleagues. For example, as the so-called form master, Klee taught formal aspects in the glass workshops where Albers was the crafts master. This implies the seniority of Klee over Albers. The book discusses major architectural commissions of which the early public ones do not survive. For some of the later ones Albers reworked what was produced during the Bauhaus years. He collaborated with Yale professor and architect King-lui Wu. He created geometric fireplaces for the Rouse (1954) and DuPont (1959) houses, the façade of Manuscript Society, one of Yale's secret senior groups (1962), and a design for the Mt. Bethel Baptist Church (1973). Also, at this time he worked on his structural constellation pieces. With Gropius he recreated “City” from glass to formica as “Manhattan” for the Pan Am building. When the building was sold and remodeled the iconic Albers work destroyed. It was his best known public work for many years encountered by New York's commuters. 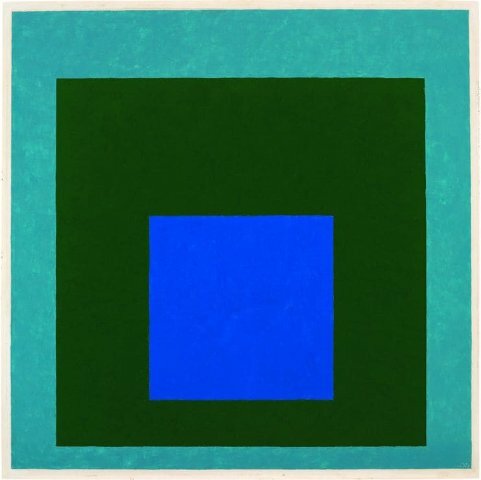 "As the son of Albers' contemporary, Xanti Schawinsky, I appreciate the statement about color being prominent in the depiction of form. And of course this is re: form on 2 dimensions. In his later years Xanti also delved into the interplay of form laid down in two dimensions, one translucent in front of another, bringing the illusion of 3 dimensions from the 2 dimensions. As one moves, left to right, one perceives the forms change position relative to each other, the illusion of moving, thereby creating the illusion of 4 dimensions; this in a time as scientists were making extradimensionality a popular understanding." "forgot to mention Erwin Hauer who taught me sculpture who Albers brought over from Austria.His architectural sculptural screens are being rediscovered by scholars"
"I saw him once as an undergrad reading in the library. He taught William Bailey, who taught me. Probably passed down a certain austerity and part/whole understanding of painting." "Nice review . Albers is a painter who ages well"